If you’ve taken a stroll in the woods lately, you might have noticed a plant with floppy green leaves that looks a little like lily of the valley. For gourmands and foragers, the arrival of this spring delicacy, the wild ramp, is like winning a prize after a long winter of fresh, wild food deprivation. 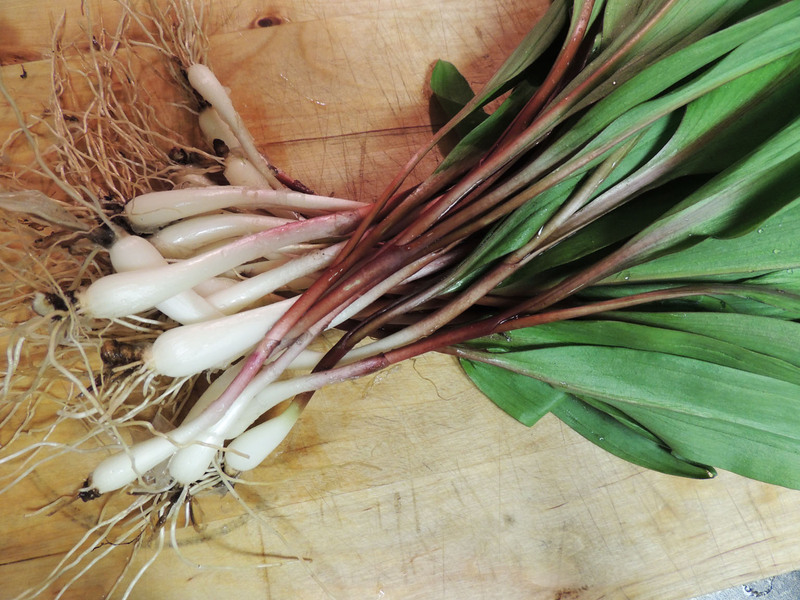 Ramps, or wild leeks, are highly pungent and smell like a cross between onion and garlic. They are a wonderful, wild delicacy, especially prized by foodies and chefs alike. Ramps add a delicious flavor profile to dishes and can be used as you would scallions and leeks. Saute them, add to stir fries, serve them with eggs, pickle them, add them to soups…the possibilities are many. Both the leaves and the bulbs are edible. Picking ramps – If you want to try some wild ramps for yourself, you need a small hand shovel to harvest them because the roots are deep and they will break if you don’t loosen the dirt around them first. But don’t remove an entire clump and avoid removing a ramp with a seed pod. Sustainably harvesting ramps will ensure there will be plenty in upcoming years. Cleaning ramps – Ramps are gritty if you don’t wash them thoroughly. Soak for a few minutes in water and then rinse well under cool running water. Pull back and peel off the translucent outer skins and trim the ends. Heat oven to 375°. In a large skillet, cook the bacon until crisp; drain on paper towels. Pour off all but about 2 tablespoon of the bacon drippings and reserve fat for another use. Add the mushrooms and ramps to the skillet and cook, stirring, until mushrooms are tender. Add the tomatoes, salt, and pepper. Cook for about 1 minute longer. Spoon the cooked vegetables into the crust; top with the cheese. In a bowl, whisk together the eggs, half-and-half, and nutmeg. Pour the egg mixture over the cheese layer and gently use a spoon to help the egg mixture sink into the vegetables. Set the pie on a foil-lined baking sheet and bake for 35 to 45 minutes, or until set and lightly browned. A knife inserted into the center should come out clean. Combine all ingredients in a food processor until smooth and pack in small containers. Use just as you would garlic butter. Heat butter in a large saucepan over medium heat. Add ramps and saute until tender, about 5 minutes. Add chicken broth, potatoes, thyme, and bay leaf. Bring to a boil, reduce heat, and simmer until potatoes are tender about 15 minutes. Remove bay leaf and puree using an immersion blender until smooth. Stir in cream. Season to taste with salt and pepper. In a food processor, mix together ramps, parsley, pine nuts, cheese, and lemon juice until you get a chunky puree. With a machine running, add olive oil in a slow stream, until mixture is smooth; add more oil if necessary. Season with salt and pepper. Serve with fresh vegetables, pita or corn chips. Store covered in the refrigerator. Makes about 1 cup.